A medicine is injected into the hemorrhoids. The hemorrhoid tissues harden, eventually healing in a period of around 5-6 weeks. This is effective for grades 2 and 3 hemorrhoids, and is a useful alternative to banding. The agents that are used in sclerotherapy are called sclerosing agents. Sclerosing agents that are commonly used include 5% phenol in almond oil and aluminium potassium sulphate and tannic acid (ALTA). Quinine urea is sometimes used as well. 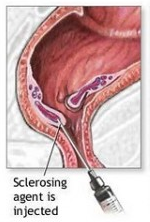 Sclerotherapy is not only used in the management of piles but is also used in treating conditions such as varicose veins and oesophageal varices (dilated blood vessels in the lower part of the oesophagus). It is done as an OPD Procedure.